Each of our restaurants and bars has its own unique style, location and atmosphere. They have in common, however, the desire of our chefs to use their classic training to provide a wide variety of Greek and International cuisine. Whether it be a gourmet meal, or a snack by the pool, each dish is carefully prepared using fresh home made products, and the flair of our chefs. 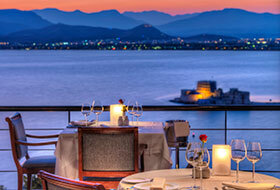 The beautiful, romantic setting of the Amimoni Restaurant is a perfect complement to the fine food and wine served here. 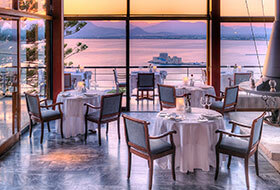 Food lovers are invited to savour fine Greek and Mediterranean cuisine. Sign up here for our newsletter and receive updates on our hotels.